This is a slightly embarrassing story, but the reactions it’s been getting tell me: You have to make a fool of yourself and tell everyone about it from time to time. So here goes. Down in Croatia with ABC Wassersport, on board the Taiga, a 37 foot Bavaria sailboat, I managed to go overboard. We had just had a nice breeze where we had all leashed ourselves to the boat. Now the wind was settling down, and the whole crew was feeling very good. Then, when we next came about, the jib sheet, that’s the line that connects to the smaller of the two sails before the mast, got stuck on the mast, and the boat was listing. The crew member closest to the mast was still on his leash, so I went towards the bow to release the sheet. But just as it was coming off, I realized, damn, I’m on the wrong side of the sail and sheet – the leeward side, so I was behind the sail. That’s a beginner’s mistake, which is why it is so embarrassing. So the sail swung out on the wind with full force and took me right with it. Splash! Anne overboard! I did a summersault backwards over the side of the boat which the others said looked pretty dangerous. But, you know, actually, it was kind of fun. I had on my life vest, which inflated the way it was supposed to, and I managed not to lose my expensive sunglasses or my contact lenses. I even kept my hat, which I had clipped onto my vest. Werner is a great skipper, so I was really quite relaxed as I floated in the water and watched the boat sail off, knowing they would come back for me. Or would they want to get rid of me, perhaps? Teacher overboard? Naaa… So back they came. Werner executed the so-called Munich manoeuvre, which brought them back in no time at all, and the crew threw out the lifesaver and gave me a hand up the ladder, all under sail. I was back on board within a minute or two, wet and salty from the Adriatic, but fine. It wasn’t until a few days later that I realized I had in fact bruised my back in falling. Bruises take a while to develop fully, and that’s when they hurt. But overall, I was very lucky, and the crew had a bit of excitement. As for me, I’ve learned a lesson for life. What comes as a surprize is how fast a boat seems to be moving relative to you when you are in the water. Werner had us swimming almost every day – the weather was great and the water was warm. So we would heave to, turning the ship so that the bow heads into the wind and the ship lies nearly motionless. Nearly – because the drift is really quite astonishing. We would tie fenders to a rope to act as buoys, tie the whole line to the boat and hold on, letting ourselves be dragged along. 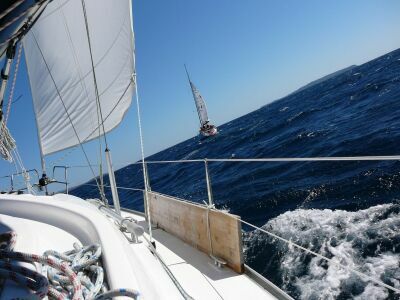 For those who wanted a little extra fun, Werner would pick up a little wind and sail a short way – but as soon as the boat was going over 1.2 or 1.3 knots it would become difficult to hold on, and at a certain point we would start to feel the tow that pushes you underwater when you are going too fast. It has to do with how big you are. Just like the length of a boat determines how fast it can go without being towed under, your physical size determines how fast you can go. It’s a live lesson in physics. I loved the week on board with this year’s English on Board crew: one of the smartest and coolest 10 year old girls I have ever met and her brilliant father, two 18 year-olds who don’t really like English but sure enjoyed sailing, two off-duty English teachers and Werner, a most knowledgeable skipper who knows the best restaurants in Istria. I’m coming back for more next summer. But, people, next year I’m not going overboard. Hey, crew, hope to see you again soon 🙂 !! oops, anne, was für eine Geschichte! Kroatien ist schön, was? Freut mich, dass Ihr nochmal kurz weg konntet! Dolcevita, mir ist eingefallen: Vielleicht hat sie ja Delfine gesehen. Wir haben diesmal vom Boot aus welche in einiger Entfernung beobachtet. Manchmal schwimmen sie auch richtig mit. sorry wg. der späten Antwort! Ah, Delfine! Wie schön! Ich habe auch mal welche im Mittelmeer gesehen und zwar in der Straße von Messina unten in Süditalien vor den Liparischen Inseln. War auch mit einem Segelboot unterwegs, allerdings eher zum Tauchen und nicht zum Segeln. Aber diese Kiesstrände in Kroatien sind auch gewöhnungsbedürftig, es ist halt relativ unbequem dort zu liegen. P.S. : ich traue mich kaum hier auf deiner Seite auf Deutsch zu schreiben, sag, ist es dir lieber, wenn auf Englisch kommentiert wird? Hi Dolcevita, Kommentare sind mir sehr willkommen, auch auf Deutsch. Das Blog hier soll ja einfach eine Einladung sein, sich mal wieder mit Englisch zu beschäftigen. Davon abgesehen finde ich es wirklich sehr nett, so in Kontakt zu bleiben.